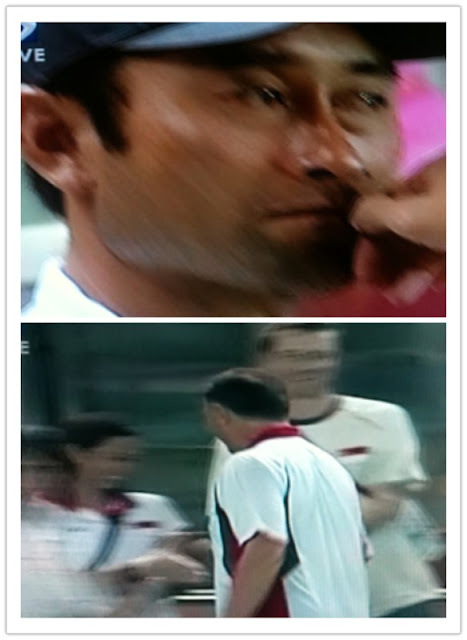 Two contrasting emotions depicted in the picture snapped off the television after the game with a grim-looking Cambodian's Korean coach Lee Tae-Hoon (top half of the picture) pondering what could have gone wrong after two straight defeats in Jakarta. While his counterpart Sloban Pavkovic (below half) breathe a sight of relieve having see the Cubs came back from a goal deficit to beat the Khmers 2-1 in the near-empty Senayan with headers from Khairul Nizam and Nigel Vanu. Following the thumping loss against the Indonesia, the Khmers started off with a fluke goal in the first half that caught all by surprise, before having to see the game slipped away with the Cubs gaining more of the dominance in the second. Already under fire from the press back in Cambodia over his recent handling of the team's affairs, Lee's future with the Khmers certainly look shaky that even before the start of the tournament my fellow blogger, Phnom Pehn based Andy Brouwer of Kingdom of Football blogged a bleak outlook before they arrive in Indonesia. Nonetheless, a much better showing from the Cubs in their second group match in terms of being more adventurous upfront, although the concern back at home is still the lack of the clinical touches in front of goal and the number of yellow cards accumulated.